UPDATE: This story was originally published on March 26. If you’ve ever made a lunch out of dollar snacks at Duane Reade — or attended a meeting solely for the soggy sandwiches — well, let’s just say: We’ve been there. Toughing it out to save cash-money when all you want to do is grab a Dean & Deluca sandwich isn’t the easiest thing in the world. But, all it takes to offset those midday hunger pangs is a little sleuthing. Yes, lucky for you (and us!) there's a plethora of delicious crazy-cheap lunch options we’re dying to send your way. 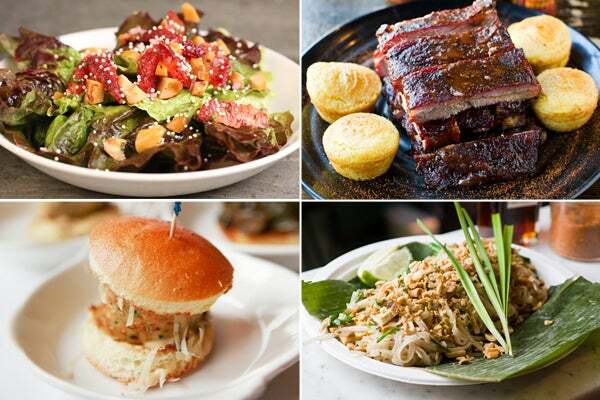 So, say hello to the newest addition on your bookmark bar: Our ultimate list of some of NYC's most delicious cheap lunchtime bites that won't leave your wallet light. (Guys, we’re talking lamb burgers, piping hot soups, and healthy rice bowls topped with super-fresh fish.) Just follow our savory sandwich-filled lead and you'll even have moolah in hand for dinner. From an on-a-budget way to eat one of New York’s most-buzzed-about pastas to an entire three-course meal that’ll only set you back just one Andrew Jackson, these low-cost, high-taste finds put Mickey D's Dollar Menu to shame. G. Esposito & Sons, 357 Court Street (between Union and President streets), Brooklyn; 718-875-6863. Some of the best tacos in the city, all for under three bones. The chorizo and pork-topped corn tortillas are fab, but the moist pulled chicken is the one you simply shouldn't leave without ordering. New Mexico Place, 189 Graham Avenue (between Meserole and Scholes streets), Brooklyn; 718-302-4573. One of Anthony Bourdain's favorites, this spot's meaty nosh is mega-cheap considering its deeply developed flavor, which is the mark of Xi'an's phenomenal dishes. Xi'an Famous Foods, 81 St. Marks Place (at First Avenue); 212-786-2068. One ball, on a bun, with your choice of sauce. Straightforward and simple, and with house-ground, high-end meats (and local veggies for their meatless iteration), it's pretty much the cheapest, highest quality snack-sized sammich you can get. The Meatball Shop, 84 Stanton Street (between Eldridge and Orchard streets); 212-982-8895. It comes in a bunch of different flavors, is a hefty, square-shaped slice of magic, and is topped with olive oil and freshly shaved parmesan when popped out of the oven. We never pass up the Grandma's Famous Slice, a gooey mix of mozzarella, basil and parmigiano-reggiano, just like our imaginary Italian grandmama would have made. Nonna's L.E.S. Pizzeria, 105 Clinton Street (between Rivington and Delancey streets); 212-477-2708. Though it's easily half the cost of most pasta dinners, the best part of this dish isn't the price: it's picking which of seven ways you'll take your noodles. We tend to go for the jaggy knife-peeled option (what can we say, we're creatures of habit! ), but you can never go wrong with big wide hand pulled, either. Tasty Hand-Pulled Noodles, 1 Doyers Street (between Pell Street and Bowery); 212-791-1817. Authentic Vietnamese food is hard to come by in the city, but the piping hot noodle soup that comes flying out of this Little Italy kitchen is some of the best in the city. Even better? The extra-large bowls of the brisket-laden good stuff will only set you back a few bucks. Pho Bang, 157 Mott Street (between Broome and Grand streets); 212-966-3797. Fried chicken on a buttermilk biscuit at a LES shack whose take on sandwiches is strictly authentic and New Orleans? You betchya. It's not just the bags of Zapps chips that makes this joint authentic, either. Its sandwich bread is flown in directly from the Big Easy, the Po' Boys and beignets are dead-on, but that fried chicken is just as lip-smacking as the stuff you're bound to fall for down in Louisiana. Cheeky Sandwiches, 35 Orchard Street (at Hester Street); 646-504-8132. If you've typically only popped in here to score up dinner party staples, pick up one of its Murray's Melts on the way out next time. The Matador, with Spanish goat cheese, Serrano Ham (the good stuff! ), tomato jam, and a black bean-corn salsa is like a gourmet tapas dinner, all in one massive bite. Murray's Cheese Shop, 254 Bleecker Street (between Leroy and Cornelia streets); 212-243-3289. The Portland and Brooklyn locations of Andy Ricker's famed Thai restaurant Pok Pok are renown for their transformative dishes, but, as it usually goes, their incredibly long waits, too. Pok Pok Phat Thai, the accessible LES extension of their sit-down spot, offers up an authentic version of the Thai standard in a more casual environment. 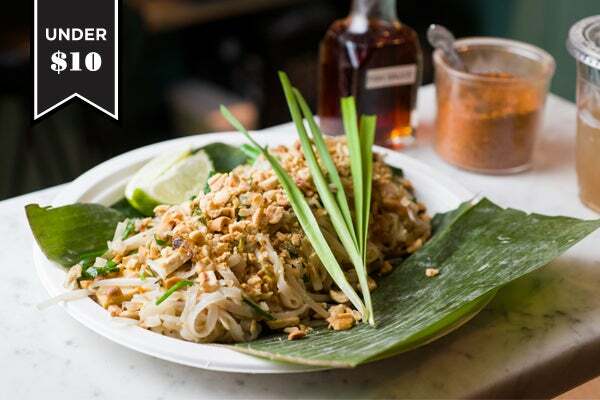 Whether you eat it there, take it home, or have it delivered to your door, the hotspot's Pad Thai Thamadaa will be the best take on Thai noodles this side of Bankok, and less expensive than the generic stuff you'd order through Seamless. Pok Pok Phat Thai, 137 Rivington Street (between Norfolk and Suffolk streets); 212-477-1299. Unwilling to shell out a ten-spot for a appetizer-sized portion of perfectly cooked pork? The Wayland's lunch-only sandwich shop has a supremely decadent bacon sammie that's full of flavor but still won't put you into a midday coma. Win-win! Animals, 138 Avenue C (at 9th Street); 212-777-7022. Absolutely one of the heartiest, healthiest soups in town, the Macrobiotic mini-chain's Hayaoto is a homemade Miso loaded with crisp green veggies like wakame and scallion, bright orange slices of acorn squash, carrot, onion, shiitake mushrooms, and fresh tofu. 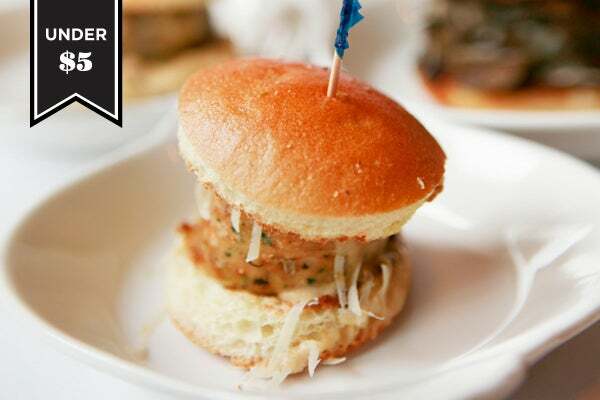 The chef at the Prince Street location makes a particularly impressive version, and when he does, it's a total meal. Souen, 326 East 6th Street (at Prince Street); 212-388-1155. You can get a mindblowingly delicious pork bun — or a Volcano, its savory bread filled with potato gratin, caramelized onion, and gruyere — with your choice of sides (chips, pretzels, cookie, or kimchi slaw) and a drink for just $10. Best part? Deal applies to Milk Bar locations in the East Village, Carroll Gardens, and Williamsburg. That way, no matter what hood you're in, there's always an excuse to have a Compost cookie with lunch. Momofuku Milk Bar, 591 Columbus Avenue (between 88th and 89th streets); 347-577-9504. Got the afternoon off and want to make a day out of it? Trek up to Dinosaur for a quarter-pound rack of its renowned specialty. Served with honey cornbread and two crazy-good sides, it's just the way to spend your early-ended day. 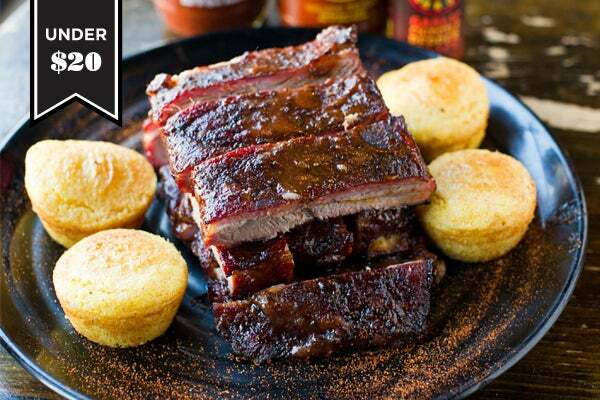 Dinosaur BBQ, 700 West 125th Street (between 12th Avenue and West Riverside Drive); 212-694-1777. Known for their Cambodian sandwiches, the mini-chain's newest NoMad location serves up the same killer food, only in bowl and noodle form. This iteration features a rotating list of incredible market fresh fish (such as salmon, Spanish mackerel, and bluefish) with roasted vegetables and yogurt chili mayo atop brown or jasmine rice. Healthy, filling, and cheaper than most! Num Pang, 1129 Broadway (between 25th and 26th streets); 212-647-8889. We'd definitely recommend asking for a double because the portions are small, but what a clean, modern — but still comforting — breakfast. Added bonus: they'll make it with almond milk if you simply ask them to! Le Pain Quotidien, 16 East 44th Street (between Madison and 5th avenues); 212-922-2976. Hooni Kim's having quite the moment with the opening of his second restaurant, though his first is still a total culinary home run. Danji's lunchtime set menus offer the choice of brisket bulgogi, spicy pork belly, or a mix of tofu and beef with soup and two side dishes for less than a midday entree at other popular spots. Danji, 346 West 52nd Street (between 8th and 9th avenues); 212-586-2880. Harold Dieterle's Thai mainstay offers a set menu complete with a choice of starter, entree, and scoop of ice cream or sorbet for the cost of Seamlessing something to your office. We suggest the Stir Fry of Aquatic Vegetables, Braised Skate & Calamari, and Thai Coffee-Chocolate ice cream, but any way you go, you won't lose. Kin Shop, 469 6th Avenue (between 11th and 12th streets); 212-675-4295.